Education in Japan is compulsory at the elementary and lower secondary levels. Most students attend public schools through the lower secondary level, but private education is popular at the upper secondary and university levels. Education prior to elementary school is provided at kindergartens and day-care centers. Public and private day-care centers take children from under age 1 on up to 5 years old. The programmes for those children aged 3–5 resemble those at kindergartens. The educational approach at kindergartens varies greatly from unstructured environments that emphasize play to highly structured environments that are focused on having the child pass the entrance exam at a private elementary school. The academic year starts from April and ends in March, having summer vacation in August and winter vacation in the end of December to the beginning of January. Also, there are few days of holidays between academic years. The period of academic year is the same all through elementary level to higher education nationwide. Japanese students consistently rank highly among OECD students in terms of quality and performance in reading literacy, math, and sciences. The average student scored 540 in reading literacy, maths and science in the OECD’s Programme for International Student Assessment (PISA) and the country has one of the world's highest-educated labour forces among OECD countries. Its populace is well educated and its society highly values education as a platform for social mobility and for gaining employment in the country's high-tech economy. The country's large pool of highly educated and skilled individuals is largely responsible for ushering Japan’s post-war economic growth. Tertiary-educated adults in Japan, particularly graduates in sciences and engineering, benefit economically and socially from their education and skills in the country's high tech economy. Spending on education as a proportion of GDP is below the OECD average. Although expenditure per student is comparatively high in Japan, total expenditure relative to GDP remains small. In 2015, Japan’s public spending on education amounted to just 3.5 percent of its GDP, below the OECD average of 4.7%. In 2014, the country ranked fourth for the percentage of 25- to 64-year-olds that have attained tertiary education with 48 percent. In addition, bachelor's degrees are held by 59 percent of Japanese aged 25–34, the second most in the OECD after South Korea. As the Japanese economy is largely scientific and technological based, the labor market demands people who have achieved some form of higher education, particularly related to science and engineering in order to gain a competitive edge when searching for employment opportunities. About 75.9 percent of high school graduates attended a university, junior college, trade school, or other higher education institution. Japan's education system played a central part in Japan's recovery and rapid economic growth in the decades following the end of World War II. After World War II, the Fundamental Law of Education and the School Education Law were enacted. The latter law defined the school system that would be in effect for many decades: six years of elementary school, three years of junior high school, three years of high school, and two or four years of university. Although Japan ranks highly on the PISA tests, its educational system has been criticized in the US for its focus on standardized testing and conformity; bullying problems; and its strong academic pressure on students. There were facilities that were created to specifically educate samurai and their children to perpetuate morality and mindfulness of their class. These schools, hanko schools, were where scholars would bring together samurai to listen to lectures on Confucianism, military arts, and other subjects. Samurai would then attempt to teach villagers what they had learned, “proper guidance to the common people’s spirit and manners,” by posting flyers and creating handbooks, Some Shōgun and Daimyō were also interested in spreading education throughout their protected land with the target audience as adult commoners and children. Elementary education was imparted as well as writing and morality lessons. The Shirakawa Village School's town bulletin explains the point of education for the commoners, "If not only the important people of the village but also the lesser people have continuous teaching from the appointed village schools, they will gain understanding". 'Commoners' would also form many communal gatherings to attempt and Englishmen themselves with the help of a scholar. To name one, Baigan Ishida, who was a great orator and writer that reached the outcropping of the merchant class. There were wakashu-gumi, or youth groups, that consisted of young men ages fourteen to seventeen, who at these groups learned about ceremonies, cooperative living, language, manners, marriage, straw weaving, and world information, not to mention talking and singing. Japan was thriving with the want for enlightenment. One may say the need for more education is one of the reasons why the Tokugawa Shogunate failed in 1868. After the Meiji Restoration of 1868, the methods and structures of Western learning were adopted as a means to make Japan a strong, modern nation. Students and even high-ranking government officials were sent abroad to study, such as the Iwakura mission. Foreign scholars, the so-called o-yatoi gaikokujin, were invited to teach at newly founded universities and military academies. Compulsory education was introduced, mainly after the Prussian model. In order to aid in the modernization the country, the Meiji government built a public library in 1872 modeled after Western architecture. The Japan Library Association (or the JLA) was founded in 1892 to promote the library. However, public education became the main focus of the Meiji government before they could strengthen the library’s presence in 1899. By 1890, only 20 years after the resumption of full international relations, Japan discontinued employment of the foreign consultants. After the defeat in World War II, the Allied occupation government set education reform as one of its primary goals, to eradicate militarist teachings and convert Japan into a pacifist democracy. Nine years of education was made mandatory, with six years in elementary education and three in junior high as an emulation of the American educational system. A number of reforms were carried out in the post-war period that aimed at easing the burden of entrance examinations, promoting internationalization and information technologies, diversifying education and supporting lifelong learning. In an effort to ease Japanese postwar sentiments, any nationalistic, militaristic, authoritarian, or anti-American content was blackened from learning materials. This practice was known as suminuru, and was used as the primary method of educational reform until newly fashioned texts, Kuni no ayumi (Footsteps of the Nation), Nihon rekishi (Japanese History), and Minshushugi (Democracy) were written by the Ministry of Education and Civil Information and Education Section. The Ministry of Education is now known as the Ministry of Education, Culture, Sports, Science and Technology (MEXT) and is responsible for educational administration. In successive international assessment tests, Japan's fourth- and eighth-grade students have consistently ranked in the top five globally in both mathematics and science (see TIMSS). (大学院博士課程後期 Daigaku-in Hakushi Katei Kōki) National Defense Academy: Ph.D.
(防衛大学校博士課程 Bōei Daigakkō Hakushi katei) Medical School: Ph.D.
Lower secondary school covers grades seven through nine, with children typically aged twelve through fifteen. There are 3.5 million primary school students in Japan as of 2012, down from over 5.3 million in 1990. However, the number of junior high schools has remained relatively static, falling from 11,275 in 1990 to 10,699 in 2012. The number of junior high school teachers has also changed little, with 257,605 junior high school teachers in 1990, and 253,753 in 2012). Approximately 8% of junior high students attend a private junior high school (accounting for 7% of all junior high schools). Private schools are considerably more expensive: as of 2012, the average annual cost of private primary school attendance was ¥1,295,156 per student, roughly thrice the ¥450,340 cost for a public school. Japan's compulsory education ends at grade nine, but less than 2% drop out; 60% of students advanced to senior education as of 1960, increasing rapidly to over 90% by 1980, rising further each year until reaching 98.3% as of 2012. Teachers often major in their respective subjects, and more than 80% graduate from a four-year college. Classes are large, with an average of thirty-eight students per class, and each class is assigned a homeroom teacher, doubling as a counselor. Unlike kindergarten students, primary school students have different teachers for different subjects. However, the teacher changes rooms for each period, rather than the students. Instruction in primary schools is often in the form of lectures. Teachers also use other media, such as television and radio, and there is some laboratory work. By 1989 about 45% of all public primary schools had computers, including schools that used them only for administrative purposes. All course contents are specified in the Course of Study for Lower-Secondary Schools. Some subjects, such as Japanese language and mathematics, are coordinated with the elementary curriculum. Others, such as foreign-language study, begin at this level, though from April 2011, English became a compulsory part of the elementary school curriculum. The junior school curriculum covers Japanese language, social studies, mathematics, science, music, fine arts, health, and physical education. All students are also exposed to industrial arts and homemaking. Moral education and special activities continue to receive attention. Most students also participate in one of a range of school clubs that occupy them until around 6 p.m. most weekdays (including weekends and often before school as well), as part of an effort to address juvenile delinquency. The ministry recognizes a need to improve the teaching of all foreign languages, especially English. To improve instruction in spoken English, the government invites many young native speakers of English to Japan to serve as assistants to school boards and prefectures under its Japan Exchange and Teaching Program (JET). Beginning with 848 participants in 1987, the program grew to a high of 6,273 participants in 2002. The program was in a decline in recent years due to several factors, including shrinking local school budgets funding the program, as well as an increasing number of school boards hiring their foreign native speakers directly or through lower-paying, private agencies. Today, the program is again growing due to English becoming a compulsory part of the elementary school curriculum in 2011. Though upper-secondary school is not compulsory in Japan, 94% of all junior high school graduates enrolled as of 2005. Private upper-secondary schools account for about 55% of all upper-secondary schools, and neither public nor private schools are free. The Ministry of Education estimated that annual family expenses for the education of a child in a public upper-secondary school were about ¥300,000 in the 1980s and that private upper-secondary schools were about twice as expensive. The average costs (tuition, fees, and living expenses) for a year of higher education in 1986 were ¥1.4 million. To help defray expenses, students frequently work part-time or borrow money through the government-supported Japan Scholarship Association. Assistance is also offered by local governments, nonprofit corporations, and other institutions. The QS Asia University Rankings Top 40 included the University of Tokyo at 13th position, Tokyo Institute of Technology at 14th, Osaka University at 15th, Kyoto University at 17th, Tohoku University at 20th, Nagoya University at 27th, Kyushu University at 29th, Keio University at 36th, Waseda University at 39th, and the University of Tsukuba at 40th. Children with disabilities, along with their parents, did not have a voice until in the 1990’s when special needs education started to receive public attention. Before then, children with disability were recognized as “slow learners” or “difficult to blend in”. 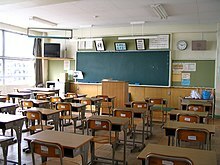 The education department of the Japanese government slowly started to focus on giving equal rights to children with disability, and the first major reform began as an introduction of a “Resource Room System", which served as a supplemental special need program for students with disabilities attending traditional school settings. Further in 2006, a greater educational reform took place to promote the notion of “inclusive education”. The inclusion education program came into act due to an influence of three political factors; the international movement for school inclusion, the reform of welfare on people with disabilities, and a general reform of the education system in Japan. The purpose of this act was to avoid isolation of students with disability with the rest of the mainstream society, and integrate special need education with traditional education system by providing a more universal and diverse classroom settings. In recent years, the Japanese government continues to pass equal rights to children with disability under special need education and inclusive education as public welfare. The Japanese educational system is supplemented by a heavy emphasis on extracurricular activities, also known as shadow education, which are any educational activities that don't take place during formal schooling. This is largely motivated by the extreme weight that is placed upon formal examinations as a prerequisite to attend university, something that is seen as integral to their future career and social status. In order to gain a competitive edge, Japanese families are willing to expend money and have their child put in time and effort into a supplementary education. Forms of shadow education include mogi shiken, which are practice exams given by private companies that determine the child's chances of getting into a university. Juku are private after school classes that aim to develop abilities for students to excel in formal school curriculum or to prepare for university examinations. Ronin are students that undergo full-time preparation for university exams following high school due to their inability to get into their school of choice. Over 86% of students with college plans participate in at least one form of shadow education, with 60% participating in two or more. Japanese students are faced with immense pressure to succeed academically from their parents, teachers, peers and society. This is largely a result of a society that has long placed a great amount of importance on education, and a system that places all of its weight upon a single examination that has significant life-long consequences. This pressure has led to behaviors such as school violence, cheating, suicide, and significant psychological harm. In some cases, students have experienced nervous breakdowns that have required hospitalization as young as twelve. In 1991, it was reported that 1,333 people in the age group of 15–24 had committed suicide, much of which was due to academic pressure. A survey by the Education Ministry showed that students at public schools were involved in a record number of violent incidents in 2007: 52,756 cases, an increase of some 8,000 on the previous year. In almost 7,000 of these incidents, teachers were the target of assault. The Japanese educational system has also been criticized for failure to foster independent thinkers with cultural and artistic sensibility. Japanese students that attend schools overseas often face difficulty adapting and competing in that environment due to lack of international viewpoints. As of 2016, Japan has 30–40 international schools. There are many Kindergarten type schools that use the word "international" in their names but this is not an indicator that they are Japanese schools in the traditional sense. These types of kindergartens are usually immersion programs for Japanese students and the schools hire mostly foreigners to act as the main class "teacher" or as an assistant to the Japanese teacher. United Nations University is located in Japan and Temple University has a branch campus in Japan. International University of Japan is an internationally top-ranked, fully English-taught University in Japan. Akita International University is also an English-taught University. Sophia University's Faculty of Liberal Arts is fully taught in English. Tokyo University of Foreign Studies is a highly selective, specialist institution for International Studies and offers some languages that are rarely taught elsewhere in the world. ^ a b c "Literacy and Language Classes in Community Centers". UNESCO. July 2016. Retrieved 28 October 2016. ^ a b c "Education In Japan". World Education News and Reviews. 1 May 2005. Retrieved 28 October 2016. ^ a b "OECD.Stat Education and Training > Education at a Glance > Educational attainment and labor-force status > Educational attainment of 25-64 year-olds". OECD. ^ a b "Education OECD Better Life". OECD. Archived from the original on 31 May 2016. Retrieved 29 May 2016. ^ "Foreign Press Club of Japan Fact Book". Fpcj.jp. Archived from the original on 2013-06-16. Retrieved 2013-01-19. ^ a b "Japan" (PDF). OECD. Retrieved 28 October 2016. ^ Tomoko Otake (2015-11-25). "Public education spending in Japan lowest in OECD for sixth straight year". The Japan Times Online. The Japan Times. Retrieved 28 October 2016. ^ a b Wright, Rebecca (September 1, 2015). "Japan's worst day for teen suicides". CNN. Retrieved August 30, 2016. ^ Harney, Alexandra (January 24, 2013). "Bad Education". The New York Times. Retrieved August 30, 2016. ^ Berlatsky, Noah (November 22, 2013). "Japan's Cutthroat School System: A Cautionary Tale for the U.S." The Atlantic. Retrieved August 30, 2016. ^ Braunschweiger, Army (May 6, 2016). "Interview: The Bullying of LGBT Kids in Japan's Schools". Human Rights Watch. Retrieved August 30, 2016. "School bullying is notorious in Japan and has been for decades. [...] School policies don't adequately protect these students." ^ Winner, Rhiannon (December 2, 2015). 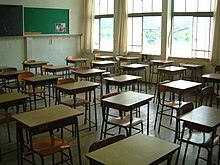 "Japan's Education Disaster". The Huffington Post. Retrieved August 30, 2016. ^ Kelly, Boyd. (1999). Encyclopedia of Historians and Historical Writing, Vol. 1, p. 522; De Bary, William et al. (2005). Sources of Japanese Tradition, Vol. 2, p. 69. ^ a b Toyosawa, Noboru (1961). "Adult Eduction in Japan in the Edo Period". Adult Education. 12: 8–18. doi:10.1177/074171366101200102. ^ Nagata, Haruki. "Public Libraries in Japan" (PDF). ^ "Japan: A Story of Sustained Excellence". Lessons from PISA for the United States. Strong Performers and Successful Reformers in Education. Organisation for Economic Cooperation and Development (OECD). 2011-05-17. pp. 137–157. doi:10.1787/9789264096660-7-en. ISBN 9789264096653. ^ Shimizutani, Satoshi (2011-11-01). "Education Reform in Japan: A Course for Lifelong Learning". Asia-Pacific Review. 18 (2): 105–114. doi:10.1080/13439006.2011.630853. ISSN 1343-9006. ^ "Binghamton University - History Department: Resources: Journal of History". www.binghamton.edu. Retrieved 2017-12-08. ^ "MEXT : Museum of MEXT". www.mext.go.jp. Retrieved 2017-12-08. ^ "TIMSS 2003: 4th grade". ^ "TIMSS 2003: 8th grade". TIMSS. ^ "TIMSS 2007: Math". TIMSS. ^ "TIMSS 2007: Science". TIMSS. ^ "TIMSS 2011: 4th grade". TIMSS. ^ "TIMSS 2011: 8th grade". TIMSS. ^ Matsutani, Minoru, "Student count, knowledge sliding", Japan Times, 10 January 2012, p. 3. ^ "Japanese students improve test scores in math, science". The Japan Times Online. 2012-12-12. Retrieved 19 March 2015. ^ "Japanese education system". Japan-guide.com. 2002-06-09. Retrieved 2013-01-19. ^ "Education Statistics". Ministry of Education, Culture, Sports, Science and Technology. Archived from the original on 2015-04-02. ^ "統計表一覧　政府統計の総合窓口　GL08020103". Ministry of Education, Culture, Sports, Science and Technology. ^ "MEXT : Statistics". Ministry of Education, Culture, Sports, Science and Technology. Archived from the original on 2015-04-02. ^ "Times get tough for teachers". The Japan Times Online. 2006-03-28. Retrieved 2013-01-19. ^ "STATISTICAL ABSTRACT 2006 edition". Archived from the original on 2008-06-17. Retrieved 2008-06-04. ^ a b Clark, Nick (1 May 2005). "Education in Japan". Retrieved 28 October 2016. ^ "The Times Higher Education Supplement World University Rankings" (PDF). TSL Education Ltd. 2005-10-28. Archived from the original (PDF) on 2006-07-23. Retrieved 2007-03-27. ^ "Asian University Rankings 2018". Topuniversities.com. Retrieved 2013-01-19. ^ "China universities dominate top 10 spots in Asian univ rankings". Japantoday.com. 2009-05-11. Retrieved 2013-01-19. ^ Furuta, Hiroko. "Developing an inclusive education system in Japan: The Case of Yamaga City, Kumamoto" (PDF). Department of Special Needs Education, Faculty of Education, Kumamoto University. Retrieved 13 December 2018. ^ "Basic Act on Education". Ministry of Education, Culture, Sports, Science and Technology-Japan (MEXT). Retrieved 13 December 2018. ^ "Special Needs Education". Ministry of Education, Culture, Sports, Science and Technology-Japan (MEXT). Retrieved 13 December 2018. ^ "Special Educational Needs (SEN)" (PDF). OECD. Retrieved 13 December 2018. ^ Kayama, Misa (2012). "Cultural sensitivity in the delivery of disability service to children: A case study of Japanese education and socialization". Children and Youth Services Review. 34: 266–275. doi:10.1016/j.childyouth.2011.10.023. Retrieved 13 December 2018. ^ Mithout, Anne-Lise (2016). "Children with disabilities in the Japanese school system: a path toward social integration?". Contemporary Japan. 28 (2): 165–184. doi:10.1515/cj-2016-0009. ^ Chris , Forlin (2015). "Educational reform in Japan towards inclusion: are we training teachers for success?". International Journal of Inclusive Education. 19 (3): 314–331. doi:10.1080/13603116.2014.930519. ^ Yamamoto, Yoko; Brinton, Mary C. (2010-02-19). "Cultural Capital in East Asian Educational Systems". Sociology of Education. 83 (1): 67–83. doi:10.1177/0038040709356567. ^ ENTRICH, Steve R. (2015-07-01). "The Decision for Shadow Education in Japan: Students' Choice or Parents' Pressure?". Social Science Japan Journal. 18 (2): 193–216. doi:10.1093/ssjj/jyv012. ISSN 1369-1465. ^ a b Stevenson, David Lee; Baker, David P. (1992). "Shadow Education and Allocation in Formal Schooling: Transition to University in Japan". American Journal of Sociology. 97 (6): 1639–1657. JSTOR 2781551. ^ Pike, Roberta (2007). Japanese Education: Selective Bibliography of Psychosocial Aspects. Jain Publishing Company. ISBN 9780895818690. ^ Bossy, Steve (1996). "Academic pressure and impact on Japanese students". McGill Journal of Education. 35. ^ Getting children to get along. (2008, December 2). The Japan Times, Tokyo. ^ Bracey, Gerald (December 1997). "The Japanese Education System is a Failure, Say Some Japanese". Phi Delta Kappan. 79: 328–330. ^ "» Member Schools Japan Council of International Schools".